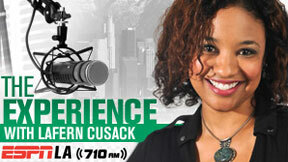 LaFern Cusack currently produces and hosts The Experience (Sun. 5a-6a) a public affairs show for ESPN LA Radio. Cusack continues to generate awareness and social change through various media forms by highlighting issues, leaders and events that inspire, create and shape our lives. As Travis & Kelvin continue to look ahead to Super Bowl 50, they look back at the Cavaliers dropping their coach David Blatt like a bad habit and also how Byron Scott can't seem to get through to Russell, Randle, or Clarkson. Kobe blames it on AAU for not teaching kids to play as part of a team and the guys wonder if there is something to that idea. Cleveland Cavs head coach David Blatt has been fired, the guys share their thoughts. Today is 10 year anniversary of Kobe's Bryant's 81 point game against the Toronto Raptors. Crosstalk with Max Kellerman and Jeff Katz. Mike & Brian continue to discuss the 10 year anniversary of Kobe's 81 point game while also touching on his election to his final All-Star game. Also, the guys check in with Mychal who talks about Kobe's 81 point game along with his son's chances of making the All-Star team. The guys discuss the pros and cons of winning the lottery. Steve and John discuss comments made by Darren Rovell on Dan LeBatard Show this morning, that the Rams are wrong for Los Angeles. Crosstalk with Max Kellerman and Marcellus Wiley. Best Of- Le Batard recently crashed a wedding. When was Will Smith's last good movie? We talk to Darren Rovell and the bride of the wedding Dan crashed. Mike and Mike in the Morning 3 a.m.
Kelvin & Travis 5 a.m. The Dan Le Batard Show 7 a.m.
Thompson & Trudell 10 a.m.
Mason & Ireland 12 p.m.
Max & Marcellus 3 p.m.
ESPNLA Rewind with Jeff Biggs 7 p.m. Weekend Warrior (Saturdays) 7 a.m. The Experience (Sundays) 5 a.m.
News around SoCal and beyond every Sunday with LaFern Cusack!